Type species: D. × pinnata Cav. Georgina Willd., Sp. Pl. 3(3): 2124. 1803. Dahlia Thunb. (1792) = Trichocladus Pers. Cavanilles, A.J. 1791. Icon. 1: 56. t. 80. Saar, D.E. & al. 2003. A Phylogenetic Analysis of the Genus Dahlia (Asteraceae) Based on Internal and External Transcribed Spacer Regions of Nuclear Ribosomal DNA. Systematic Botany 28(3):627-639. 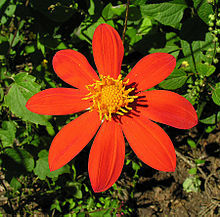 For more multimedia, look at Dahlia on Wikimedia Commons. This page was last edited on 19 February 2019, at 12:38.